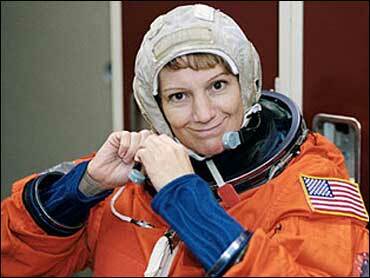 Discovery's commander is Eileen Collins, who made history in 1997 as the first woman to pilot a space shuttle. Two years later, she became NASA's first female commander. When The Early Show co-anchor Rene Syler talked with her, she was, of course, excited about Wednesday's planned launch. But she also has Columbia on her mind. "Clearly, I'll be reflecting," Collins said, "I think about the Columbia crew every day." For Collins and the six other shuttle Discovery astronauts, their upcoming mission will be filled with reminders of those who went before. Collins noted, "So one of the things we're going to do as a crew is fly their picture and put it on the mid-deck so we could see it every day, because we are truly, we're doing what they would want us to do, and we're carrying on their mission." In the wake of Columbia, an investigative panel found that too often, NASA would insist on getting shuttles off the ground, "ignoring" potential warning signs. And that scenario may have doomed the Columbia mission. "All of us have learned from this," Collins told Syler. "We're not going to forget it. We brought the focus in on the safety of our space program, and you can't run a space program on a shoestring budget and with schedule pressure." This time around, NASA imposed several delays, while looking at every potential safety concern. Michael Griffin, NASA administrator, said, "We're going to return to flight. We're not going to rush to flight. And we want it to be right." For Collins, returning to flight after two-and-a-half years carries an enormous responsibility. Not just to her crew, but also to her 9-year-old daughter and 4-year-old son. Collins said her daughter is old enough to understand the risks, but noted, "I have asked her several different times, 'Are you worried about my safety?' She always says, 'No, Mom. I just don't want you to be gone for three weeks!'" Collins continued, "And she's not worried about the safety of the flight. And I think that's really because I've been right up front with her, with the shuttle accidents that we've had in the past. I've talked to her about my mission, how much I believe in the mission. I've showed her videotapes of my past flights." Collins' husband, Pat Youngs, a commercial airline pilot, also knows the risk. Every mission, he says, gives him butterflies. Youngs said, "You know, there's no such thing as a 100 percent guaranteed safe space flight. But Eileen has said that she wouldn't fly if she didn't think it was, you know, as close to 100 percent safe as it can be, and I believe her." And Collins said she is ready: "Women will come up to me and say, 'Thank you for doing this. Because of what you've done, I now have better standing in my job with the guys I work with - just because a woman flew as a shuttle commander.'" While Collins seems to have it all today, nothing came easy. She spent some time in a public housing project; her family, at some point, had to rely on food stamps. She worked in a pizza parlor to earn money for flight lessons. She said, "Folks back home would never have guessed that I would be an astronaut some day. There is no way. "My parents did not have the money for flying lessons. I mean, that would be completely out of the question. So I did all that myself. And that was a hard decision for me to make, because no girls were flying. That was a boy thing." But now, she says, there are fewer girls and boys going into science fields. Collins and her crew want to change that, and bring back the excitement of space travel. "We will go back to the moon someday," she said, "Not just to visit and come home, but to build space stations, and eventually go on to Mars." Asked if she thinks that will happen in her lifetime, she said, "I would; I hope, in my life, I see people walk on Mars. But that's what NASA's all about. We do things that no one's ever done before, and sometimes these things won't work. But that's our charter, to go out and explore and try new things." Discovery was supposed to launch a month after Columbia, way back in March of 2003. The stakes of mission are now dramatically higher. But many around NASA say that for such an important flight, there is no one better suited to be at the controls than Eileen Collins.